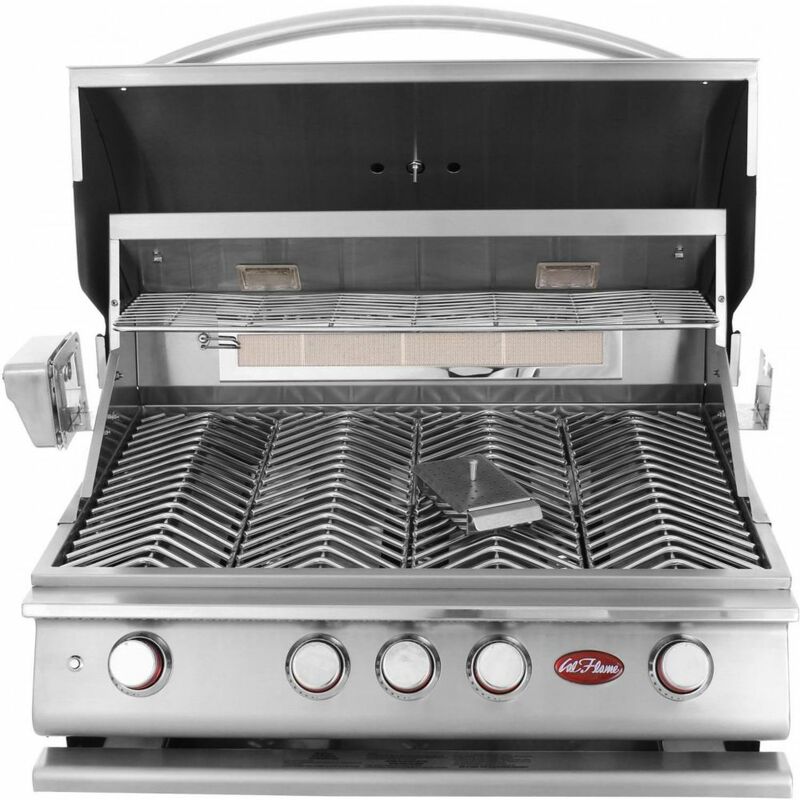 The Cal Flame Built-In 4-Burner Gas BBQ Grill has the cooking power of up to 75,000 BTUs. This stainless steel grill features a convenient full width drip tray, four cast stainless steel burners with independent ignitions, lip guards on all burners to prevent clogging, independent knobs with an exclusive patented design and convenient lights to cook day or night. The rotisserie feature has motor mounts on the grills left or right side and includes an independent 15,000 BTU rear burner that is ideal for rotisserie cooking. Enjoy favorites like eggs or bacon with an easy to store griddle tray designed to fit the Cal Flame grill or infuse BBQ with the smoky flavor everyone loves with a covered accessory smoker tray. The Cal Flame grill cover is included. Grill comes with a 10 year limited warranty. 4-Burner Built-In Stainless Steel Propane BBQ with Accessory Kit The Cal Flame Built-In 4-Burner Gas BBQ Grill has the cooking power of up to 75,000 BTUs. This stainless steel grill features a convenient full width drip tray, four cast stainless steel burners with independent ignitions, lip guards on all burners to prevent clogging, independent knobs with an exclusive patented design and convenient lights to cook day or night. The rotisserie feature has motor mounts on the grills left or right side and includes an independent 15,000 BTU rear burner that is ideal for rotisserie cooking. Enjoy favorites like eggs or bacon with an easy to store griddle tray designed to fit the Cal Flame grill or infuse BBQ with the smoky flavor everyone loves with a covered accessory smoker tray. The Cal Flame grill cover is included. Grill comes with a 10 year limited warranty. 4-Burner Built-In Stainless Steel Propane BBQ with Accessory Kit is rated 4.5 out of 5 by 6. Rated 5 out of 5 by Joseph from very well made for the price point. arrived completely assembled ready to install into cabinet I ... very well made for the price point. arrived completely assembled ready to install into cabinet I purchased separately. I had to get another lp bottle connection because the cabinet bottle location was opposite side from gas connection. I am very satisfied with purchase. Rated 5 out of 5 by Davis from Was exactly what I was looking for. Easy to clean. Construction top notch. Was exactly what I was looking for. Easy to clean. Construction top notch. Rated 2 out of 5 by Stuie from 5 years and I'm replacing it. Poor quality burners and knobs. Cal Flame has little or no customer... 5 years and I'm replacing it. Poor quality burners and knobs. Cal Flame has little or no customer service. Get a different brand. Rated 5 out of 5 by Anonymous from Built in BBQ grill Solid, well built product. Puts many other grills to shame. Rated 5 out of 5 by Murrayjr from Extremely high quality This is a replacement for the same make and model that lasted about 7 years in an outdoor kitchen that received some extremely heavy use. It would have lasted longer if I had been a little more diligent in my cleaning. Rated 5 out of 5 by Grubes from I love this grill I love this grill (sang to the tune of Toby Keith's "I Love This Bar"). we were going to go with a 5 burner but we didn't have the space so we chose the midsize 4 burner and we couldn't be happier. We have room for not only for an intimate family cookout but also for large holiday parties like Memorial Day and July 4th where we need to cook dozens of burgers at once. The solid stainless steel construction makes this grill heavy but its worth it - no rust, easy to clean - plain awesome sauce! It even comes with a smoker tray and rotisserie. We haven't used them yet but we want to use them together to make smoked meat like a brisket or chicken. We cook out a lot, even in the winter and this thing is worth it's weight in gold...or is that .304 stainless steel?